The Horizon Poker Network site revealed that its new daily online poker freerolls run from Mondays to Fridays at 4:30pm, 6:30pm and 8:30pm New York time with the winner of each progressing to compete in a Sunday tournament with $300 in the pot. To make things even more interesting, finishing second in any of these games will earn competitors a spot into a subsequent Saturday tournament featuring a $200 prize pool while those coming fourth to seventh will sit down to a Friday $100 bounty game. As if this wasn’t enough, an additional eight players will be asked if they would like to take part in a daily $100 game for just $1 while Mondays and Tuesdays from 9pm will see the online poker site run freerolls with $150 prize pools before this is increased by $50 on Wednesdays. 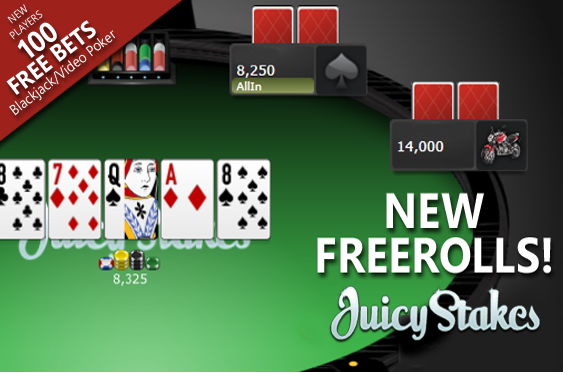 “In addition to our busy online poker room, Juicy Stakes also operates a very popular online casino with a complete suite of casino games,” read a statement from Juicy Stakes. Juicy Stakes is further enticing new players to give its site a whirl by offering a special welcome bonus that sees newbies gifted 100 blackjack bets or video poker lines with each valued at $1. “Players can make their free bets on any blackjack or video poker game in our casino [such as] blackjack, Face Up 21, Double Draw, Perfect Pair, Deuces Wild, Bonus Poker, Double Bonus Poker, Jacks Or Better, Aces And Faces, Double Joker Poker, Tens Or Better, Joker Poker Kings, All American Joker Poker Aces or The Saloon,” read the statement from Juicy Stakes. Domain is awarding new players with 100 complimentary blackjack bets or video poker lines each valued at $1.